With the Memorial Weekend upon us I am finally catching up on my blog. Between my new job and training for my half ironman in July I haven’t had too much time to sit down and recap so here goes. March and April 2017. Better late than never. Rather than use my Nike+ Summary to recap I’ll be sticking to my Garmin Connect data as it catches more of the workouts than just running. I still use Nike to track my workouts but my Garmin device syncs the data to the Nike site so it is the same. March was marathon month. My total mileage for the month was 143 miles which was made up of 128 miles of running and 15 miles on my bike. You will see that there was another day of snow shoveling but thankfully that was the last of the winter snow. The month started with me actually gaining acceptance to the New York City Marathon on my third attempt at going into the lottery. As you will know, I didn’t make it in previous years but my wife was accepted in 2016. I ‘race chased’ her during the event and this made me more motivated than ever to get into the event. The good news is that I got accepted. The bad news…I have a family engagement in Virginia and I cannot do the race this year. I have deferred to 2018 so while I don’t have to enter the lottery next year, I have to wait almost 22 months to run the race. Fingers crossed that all is well and I can fulfill my goal next year. Good news….just a very long wait until November 2018. My wife and I ran the Rock ‘n’ Roll DC Marathon on March 11. My recap is here. It was a great but very cold weekend. That was marathon number 9 for my wife and number 18 for me. Fun times together. Taking advantage of a weekend away and doing some sightseeing. Once I got back from DC I was away on a training course for my new job for the next four days. I had planned on resting but the food was both good and plentiful. I spent every morning getting up at 4:30am and hitting the hotel gym for a good number of miles in what should have been my recovery week. Oh well. On the plus side I was in the hotel when the last major storm of the winter hit. My family was not so lucky. Hence the snow shoveling on my return home. My total mileage for April was 160 miles made up of 147 miles of running and 13 miles on the bike. A big milestone for me this month was reaching 10,000 miles of running since I started logging my workouts in September 2011 (just over a month since I began my couch to 5K program). This happened on April 2nd. At the start of the month, my wife and I took part in the Phillies Charities 5K down at Citizens Bank Park in Philadelphia. Home of the Philadelphia Phillies. It was a great spring morning and the weather was perfect for running. We did a pretty good time together and we earned ourselves another medal, tickets to an upcoming game and some time on the field for photos. We took our boys to their first game of this season on April 8th and we saw a history making win over the Washington Nationals. They scored 12 runs in the first inning to win the game 17-3. It was a great night for baseball and we all had a fun time. On April 9th I took part in the Bookin’ For Lookin’ 8 miler in Newtown, PA. Over the last few years I have not been able to run this event and only participated by making a charitable donation. This year, without any races on the calendar (the last two years have been the Rutgers UNITE Half Marathon) I took part in this event. It started out at Council Rock High School and was an 8 mile out and back loop into Tyler State Park and back. It’s a hilly course but I hit my stride early on and was very pleased with my time. It was a glorious sunny day and the event was well managed. I’d recommend it if you live near and have the opportunity. It is a fund raiser for two local charities, Foundation Fighting Blindness and Bucks County Association for the Blind and Visually Impaired. Here is the elevation chart. I’m not exaggerating about the hills. Pleased with my time, especially on those hills. May starts the beginning of my half ironman training. I hope that I will not be waiting too long to post my recap but please bear with me in the meantime. I should have lots to report over the next few months. Okay, so I know this is late June as I write, but May is still technically last month so I’m squeezing in a late ‘Month in review’ (you’ll understand why below). At the beginning of the month my wife and I ran the 2016 New Jersey Marathon. You can see the distance recorded at the start of the monthly summary. 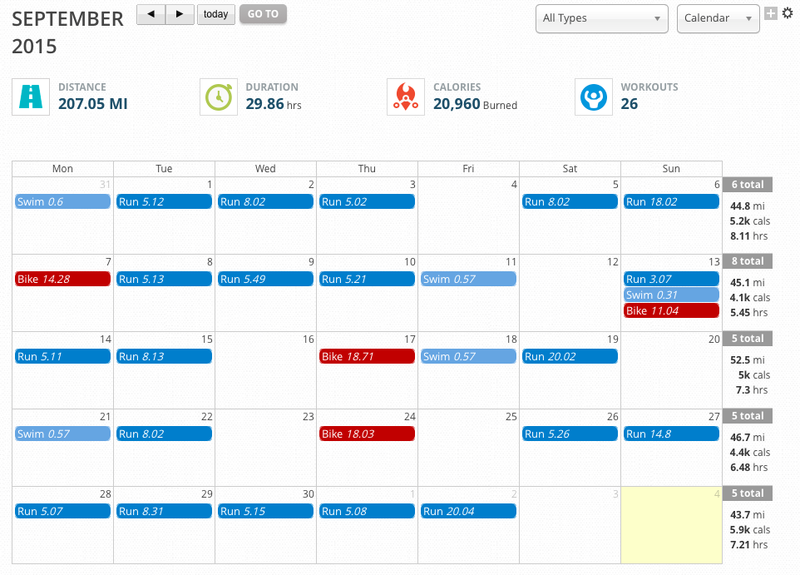 What you see after that is a long gap of 9 days between runs and a total of just under 84 miles run in the month. I shall explain shortly. As you can see from my Garmin data below (where I record all activities swim/bike/run) I covered a total of 288 miles (8 miles swimming, 196 miles on the bike and 84 miles running) as my focus after the marathon was on training for my half iron distance triathlon in July. As I mentioned in the review of the 2016 New Jersey Marathon, it was a very wet and cold day. After the race I came down with a cold and a bad sinus infection which resulted in a nice expensive journey to the Minute Clinic early on a Sunday morning to get a prescription for some antibiotics. In addition to this, I had a pretty bad cough which led to some sore chest and back muscles. I took a few days of rest to help everything clear up. I thought I was doing okay so I got up on the morning of the 10th to do a bike workout and as I bent over to put on my bike cleats I threw my back out. Ouch….a long crawl back to bed where I was laid flat on my back for two days with a strained sacroiliac joint. That kind of put a damper on all the triathlon training I had planned. I ended up missing almost two weeks of my training plan and was getting a little concerned as I haven’t gone beyond a sprint triathlon before. Multiple trips to the chiropractor over a series of a few days, lots of ice and heat treatment and I started to loosen up. My wife was the race director for an inaugural 5K for her company and we had been the first to sign up. I was a little concerned about running still so I took an easy 2 mile run the day before to see if all was okay. Thankfully it was. No sign of any recurrence. I was feeling good going into the race. The morning of the 5K my wife left early to set up so I headed down with my Father-in-law and the boys. My Father-in-law and I were running the 5K and the boys were running in the 1 mile run which took place after the 5K had completed. We got to Cooper River Park early and my boys went straight to the post race refreshment table. I don’t even want to know how many donuts they ate while I was getting everyone’s bibs for the race. I was still a little concerned about my back but the park looked pretty flat so I thought I would see what kind of pace I could maintain as I don’t run many shorter distance races these days. I actually ended up running a very decent pace (although the race was actually more than a half mile longer than a 5K). I ended up 10th overall and placed 3rd in my age group with a sub 8 minute pace. Pretty happy considering that I was laid flat on my back a few days earlier. Good enough for 3rd place in my age group. My eldest however didn’t realize how many laps made up the mile distance. It took him a few minutes to recover. With the boys new-found excitement for running we decided to do what we could to encourage them to do some more. 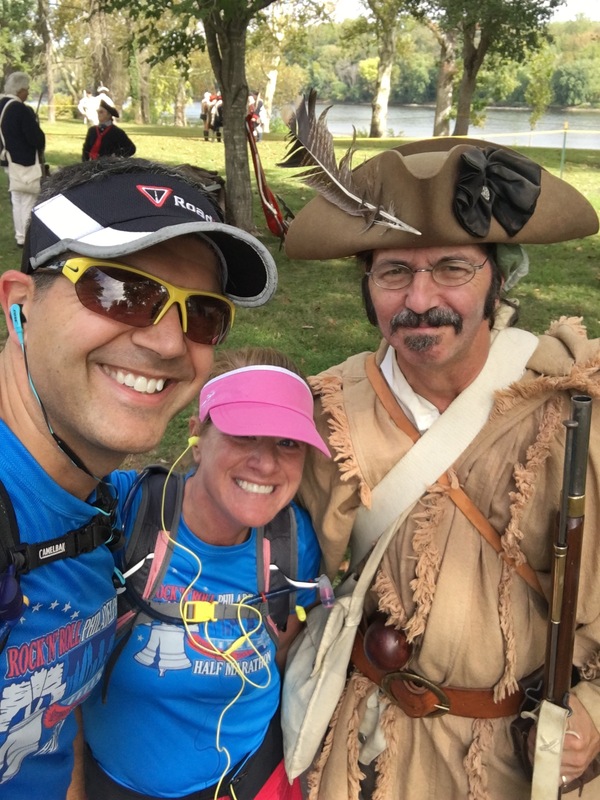 I signed both boys up for another 1 mile fun run on July 4th (the Washington Crossing Revolutionary Run which I ran last year) and I also signed them up for the new Disney Shorts Virtual 5K. We plan to train with them all summer and run the actual 5K when we are on vacation in Myrtle Beach in late August. I will give them their medals and they can wear them around the beach resort. We took the boys out to run along the Delaware Canal Towpath over the Memorial Day weekend which was a lot of fun. Hot, but fun. As we did when we ran with them in the stroller together, we started and finished outside of our favorite bakery so there was some incentive to their efforts. Running south on the canal on our first outing. Running north on the canal on our second outing. Running back to the bakery on our second outing. Now that I was feeling back to normal it was headfirst into the triathlon training. I’ve trained many times for marathons but this was a whole lot different and much more intense. I guess it’s the daily double workouts typically about an hour each which is the main difference. I am doing my second workouts sometimes after the boys are in bed and it is pretty late for someone like me who is usually an early bird when it comes to training. The biking and running brick workouts on Saturday are typically more time than I spend exercising especially when I still have my long runs to do on Sundays. It is worth it to achieve my goals but it is exhausting. I’m sure it will all pay off as I have put in a lot of effort to try not to miss any scheduled workouts. I am feeling much better with my swim. I still have my concerns about the bike but I am at least feeling a little more comfortable in the saddle. You can see from the summary below how much time I am putting into this. Training Peaks workout summary for the triathlon training. And how early I am getting up to do these workouts (from my Fitbit sleep tracking). With all this extra training, it does build confidence. I am feeling stronger in the pool and I’m actually enjoying and looking forward to my swim sessions. The bike, I’m still ‘eh’ for now but hopefully I’ll be more comfortable as my training progresses in June. Thanks for taking the time to read. Apologies for the late write-up. As I said when I began, technically it is still last month so I’m getting in before the SAG wagon creeps up on me. My total mileage for the month was 200 miles. Although my Nike+ summary says 150.5 there seems to be an error in the site 😦 as the total running actually adds up to 163. I managed to knock out 1.6 miles from the limited time I spent in the pool this month and I put down 36 miles on the bike (unfortunately indoors on the bike trainer only). 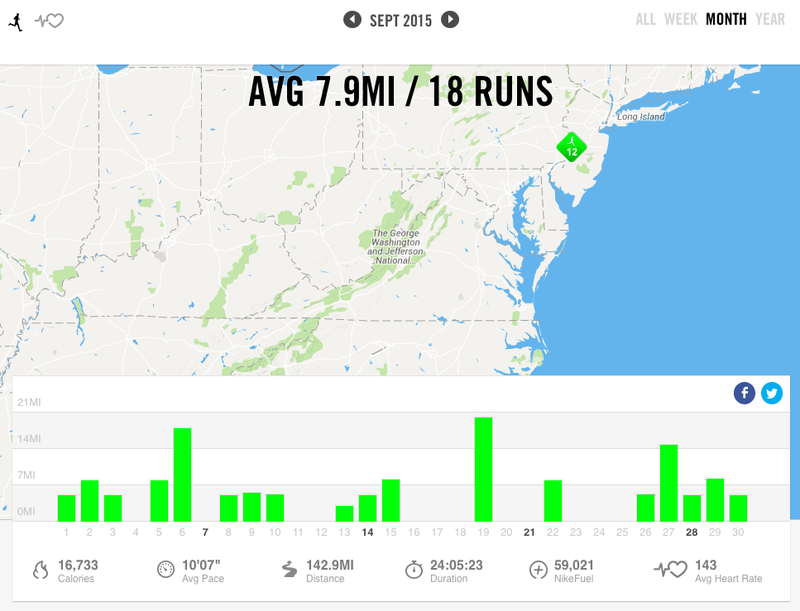 This was a big month for marathon training for the upcoming New Jersey Marathon on May 1st. Although I still have one long run left in April before the taper, March saw me crank out three long runs of 17, 18 and 20 miles. I’ve managed to wear down two pairs of shoes so I’m getting ready to break in the new shoes for the marathon soon, taking my last two pairs of Brooks Adrenaline GTS 15‘s out. Post marathon I’ll be looking to do some more runs in the Altra Provision 2.0s and looking to move up to the Brooks Adrenaline GTS 16’s. The Brooks has really been my ‘Go To Shoe’ (GTS) since I started running marathons back in 2011. Breaking out the last pairs of Brooks Adrenaline GTS 15’s to break in for the marathon. At the beginning of the month we found out the results of the New York City Marathon lottery. My wife was accepted but for me it’s another year with no entry. I actually had signed up for the Princeton Half Marathon on the same day prior to entering the lottery but now that my wife is running I will forego the race so I get a chance to travel, support and cheer for her on race day. I’m looking forward to going and I’m planning how I can crisscross the subway system to see her as many times as possible. I will probably look at the lottery again for another year. With not getting into New York City this year I looked to a Fall race that my wife and I had discussed as a backup plan. We are now going to be heading to Albany, NY in October to run the Mohawk Hudson River Marathon. My wife will be running the half marathon that day as it fits nicely into her training plan for New York City. We have family up there so are planning to take the boys and making a weekend out of it. With my calendar now all confirmed for the year (plus signing up again for the 2016 Philadelphia Marathon when registration opened up on April 1st) I was able to update my training plan for the year. You can follow the link to my insanity here. This month I finally got fitted and took ownership of my new road bike for the upcoming HITS Hudson Valley Triathlon this July. The folks over at Guy’s Bicycles near me were really helpful in finding the right bike for me for the right needs and at the right price I could afford, a 2015 model Scott CR-1 30. They took time to explain the different options available and they fitted me for my specifications on the bike swapping out any components that needed to be adjusted to fit me just right. I’m looking forward to getting outdoors on this once the weather improves and I have enough early morning daylight hours to ride outside before work. The fitting process included adjusting the seat height, angle of the seat post/saddle and the reach over the frame. They did replace the saddle…. See? I did leave with a saddle. Ready to roll. Yes, my license plate does say 007. Back home and ready to ride. Mid month I had to take a trip down to McLean, VA to do some work out one of our offices. It was an opportunity to run outside again as it was a little warmer down there. The office is on a very large corporate campus near Tysons Corner, VA and my hotel was right next door. I planned out my routes and each and every day and still I got completely lost. It was only the sight of my office building (beautifully lit from the outside) that I was able to locate my hotel each day. Headlamp running does have its drawbacks, especially for the geographically challenged. This was my guiding light home every morning. Easy to spot and much more impressive when seen for real. Also this month I ran the Philadelphia Phillies Charities 5K with my wife. She has run the event every year since it began and this was a first time run for me. It was a chilly morning but it was a fantastic run. We ran together and hit a pretty good pace. The swag from the race was impressive with each of us getting a shirt, a medal and two tickets each for a pre-season game, one of which we were able to swap for a later game in the season. We also got a chance to get onto the field to take a few pictures after the race. We earned our pretzel that day. Pre race. Trying to keep warm and wearing as much red clothing as I could manage. Go Phillies. Medal, schmedal. I got a pretzel!! Happy with our pace. We ran step for step together. And finished with a fun photo opp. I got a package late in the month from my buddy, fellow Mickey Miler and host of The Marathon Show, Eddie McCoy. 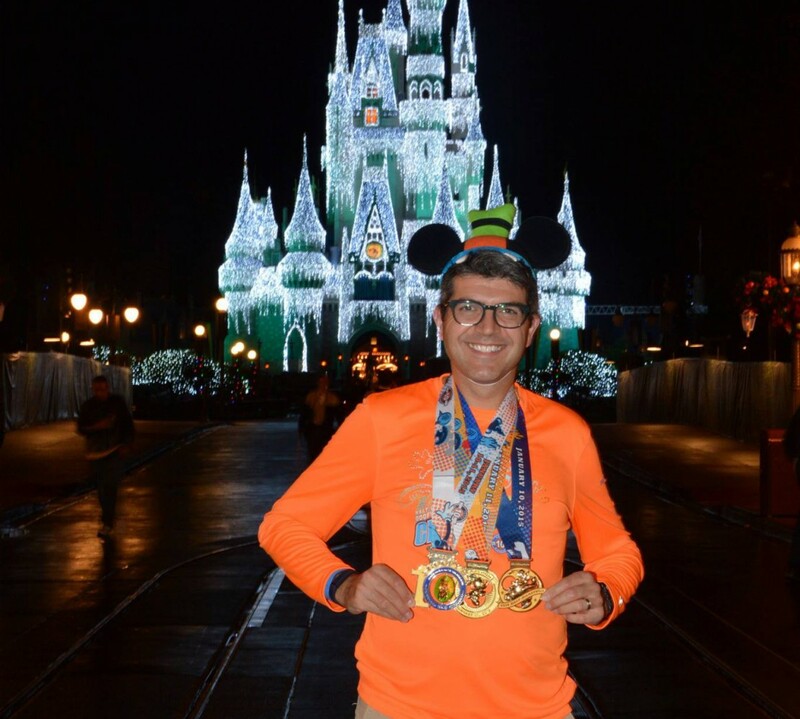 In addition to all his training, work, life and other activities he has managed to plan for and provide team shirts and jerseys for our running team the Mickey Milers. Looking forward to wearing my new long sleeve jersey (although hoping for warmer weather to so I don’t have to wear it too often). Yup. They got that right. Mickey Milers purple and yellow. Earlier in the month I was invited to participate in a recording of the ‘Let’s Run Disney’ podcast to discuss my ‘Goofy in a Day’ experience from last May. The podcast was released at the end of the month and you can get to the link from here. It was fun to talk about the experience and it was nice to be a part of the show. Thanks for taking the time to read my month in review. I appreciate you stopping by each month. March was very busy but there is plenty to look forward to this year with the upcoming New Jersey Marathon coming sooner than later. As a reminder, I will be participating in the HITS Hudson Valley Triathlon this July and raising funds for Autism Speaks through this event. If you would like to sponsor me you can get to the sponsorship page here. I appreciate your support. Another busy month. According to my Nike app I ran 143 miles and my MapMyFitness calendar showed I had a total of 207 miles (143 miles running, 62 miles cycling and 2 miles swimming). This month included the Hightstown Triathlon, my 3rd(ish) and last triathlon of the year and also the last few weeks of training for the Marine Corps Marathon so plenty of training during the month in preparation. Fall definitely made an appearance during the month but luckily it was still fairly warm during the triathlon so I was able to enjoy the last days of summer. 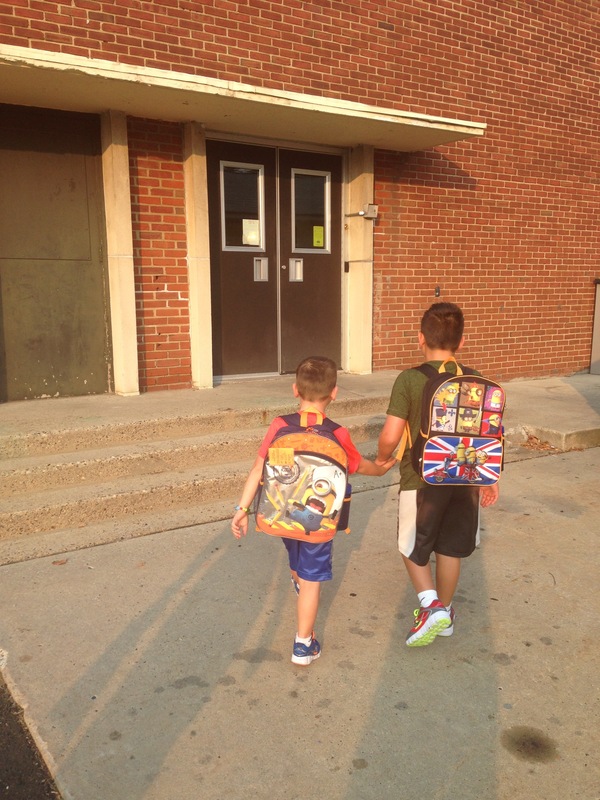 Our boys went back to school, my youngest is now in Kindergarten so both boys are together again at the local elementary school. Also, as he has now moved up to Kindergarten, he is now at Sunday school every week vs every other week like last year. This allowed my wife and I to have 3 hours together on Sunday mornings so we were able to get some marathon training in together which was a great as we probably hadn’t had a chance to run together as a couple since the Pittsburgh Marathon back in May. We’ve been taking the opportunity to get some of the long runs in along the Delaware Canal as it is fairly flat but very close to where we take the kids for Sunday school so we can save some time. It’s been great running there as the temperatures have cooled. We changed our route up a bit this year and crossed over the Delaware River at Washington’s Crossing so we ran both on the Pennsylvania side and the New Jersey side. Just to mix things up. 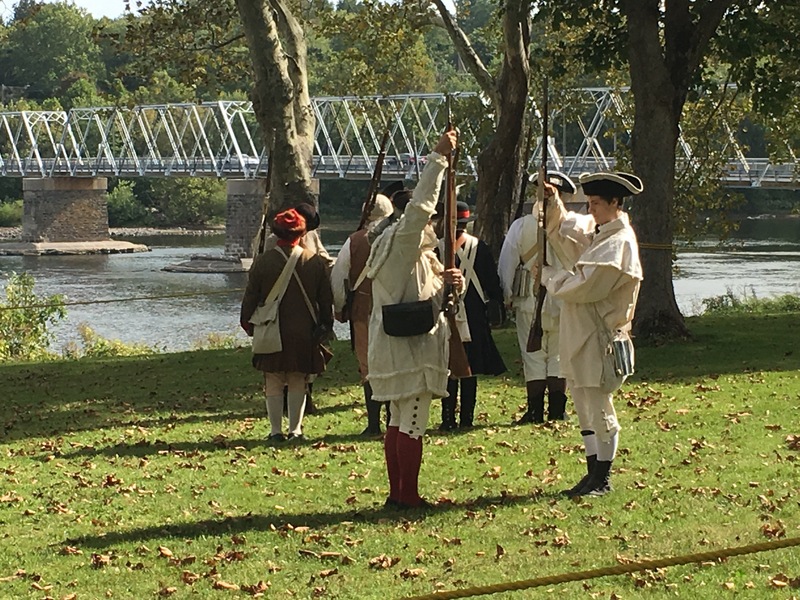 On one of the times we were running together we crossed back to the PA side and saw a group of Revolutionary War re-enactors walking around Washington Crossing Park. We got a bit of a surprise when they started shooting off muskets and it didn’t really help when we ran through the park and my wife pointed out to them that I was British…thanks Babe, appreciate that. Work is ramping up again so I am back to traveling for a while and finding some time to squeeze my training in. I find fitting the swim training in a bit more difficult as I’m not close to my gym but I did manage to find an LA Fitness near the hotel in Atlanta to allow me to get a swim day in before the triathlon. My triathlon races are done for now for this year and once I am back home during the winter months I can ramp that up again with plans for next year. So we end the month just a few weeks away from our big race of the year, the Marine Corps Marathon. My wife and I are really looking forward to running this together. We will be travelling down without the boys this time around as it is going to be a pretty quick trip. I definitely want to take them next summer to visit the museums and enjoy the sites. That will be a fun vacation. We can scope it all out as we are running along the route. October 25 – Marine Corps Marathon (Washington, DC) – This will be our first time running this event. 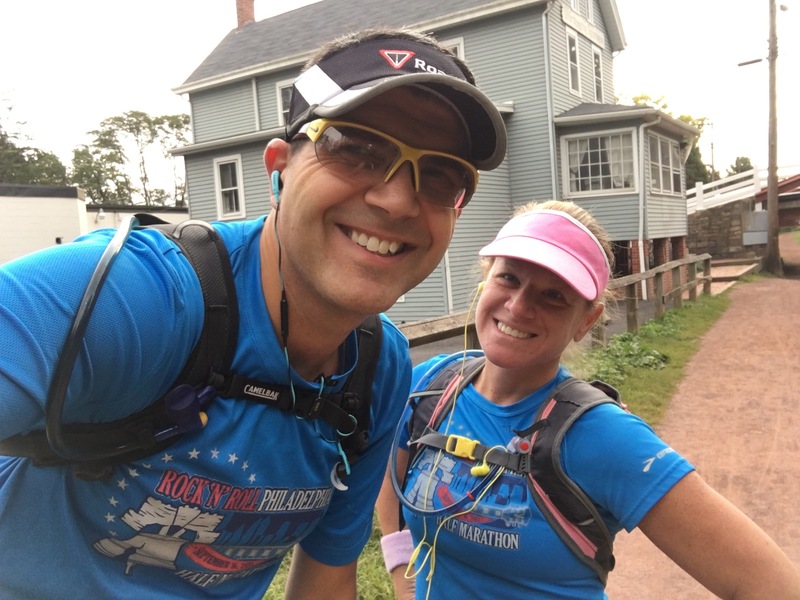 October 31 – Rock and Roll Philadelphia Half Marathon – I ran this event on my own in 2012 and as a couple in 2013 and 2014. November 1 – Cooper Norcross Run the Bridge (Camden, NJ) – I ran this event for the first time in 2013. November 22 – Philadelphia Marathon – In 2011 this was my first marathon and also the first where I broke 4 hours in 2012. My wife and I ran this together in 2013. November 26 – Bucks County Road Runners Thanksgiving 5 Miler (Langhorne, PA) – We try to run this every year (since we started running) and only missed it last year by being out of town. Here is my last recap of that race. Looking forward to October and beyond. Thank you for reading.